New York City’s Greenwich Village, also called “The Village” by locals, has long been known as a vibrant, funky neighborhood where artists live, work, and play. It’s no surprise that some of the city’s most creative interiors come from apartments and townhouses in the area. If you’ve ever wondered what the inside of a Village home looks like, now’s your chance to take a peek. 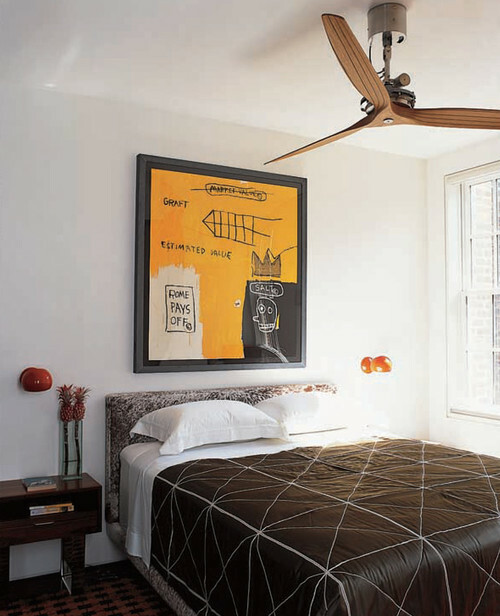 Let’s get inspired by these five stylish Greenwich Village Bedrooms. This somewhat industrial guestroom in an 1840s Greek Revival townhouse keeps the décor simple but adds a touch of funk in the accessories. The ceiling fan is especially interesting. Compact yet complete, this Village bedroom boasts masculine colors. The bed against the window would normally be taboo, but with the layout of the space, it’s probably the only option. The windows hit above the top of the bed, so the design works well. 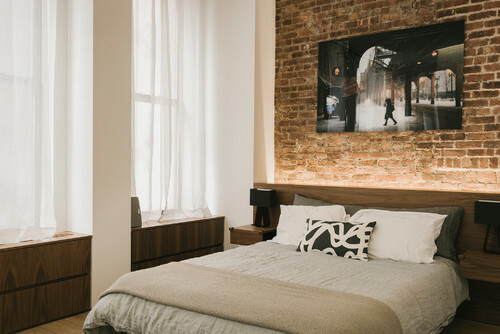 A Greenwich Village loft celebrates exposed brick. Sheers allow light to filter through tall windows, and built-ins keep the room clutter-free and save space. Notice the tiny bedside lamps. This bedroom is the work of legendary designer David Easton. Colors are soothing, and the lighting is warm. The paneled bed wall makes for a soft backdrop, setting the stage for the straightforward yet elegant furnishings. Photo by David Easton Inc. So many young adult books these days are about reluctant heroes, boys and girls finding themselves battling monsters and unspeakable evil. This book is not about those people. This is about the kids in the background. The “normal” kids. It’s a really interesting twist on this classic trope of YA fiction. Something weird is happening in this small nameless town somewhere in western Washington. Kids are going missing, strange blue light is bursting into the sky. But this isn’t what Mikey is worried about. He’s a teenager gearing up for the end of his school year. He’s in love with his best friend. His sister has an eating disorder. He has OCD. They really don’t have time for monsters, inter-dimensional portals, or any of that stuff. That stuff is for the Chosen Ones; known in this book as the indie kids. They have names like Satchel and Finn. All we know about the fight against otherworldly evil is explained in the titles of the chapters. For once they are the background characters. I love this unusual twist on YA fantasy fiction. I’ve read many books about chosen kids, balancing school and relationships with a fight against evil. What about the other kids? The ones who just want to get through finals, go to prom, find love? 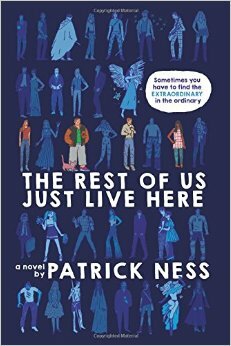 The Rest of Us Just Live tells their story. And it’s a really good story. It’s all about the angst of absentee parents, of leaving high school and the friends who have kept you going. It’s about love and jealousy and family. The mysterious blue light infecting the people and animals of town certainly doesn’t help. But Finn and Satchel and Finn and Finn will take care of that. Mikey and his friends are too busy cramming for final. A fun and thoughtful book for teens who enjoy the monsters and zombies but want a little more. A mobile home might not seem glamorous or even desirable, but for nomads who prefer not to be tied down to one place, living in a camper or RV is the ideal lifestyle. What’s more, compact spaces, including shotgun trailers, can still be incredibly chic. 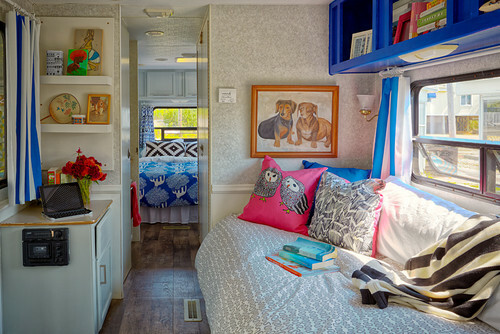 These four mobile home bedrooms prove it. Midcentury in style, his Avion camper renovation provides all the comforts of home but in a small, movable space. The owners keep the Airstream well stocked so they and their friends can show up with their personal belongings at any time. Owning a camper like this one is almost like owning a vacation home but at a fraction of the price. 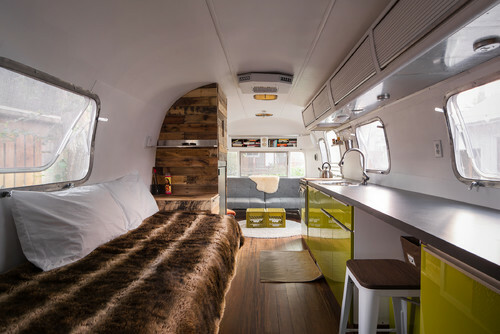 Another Airstream, but this one in Salt Lake City, takes modern design to a new level. Sleek and practical, the interior uses plenty of warm wood, laminate, and lacquer, and the designer threw in some faux fur, which adds an element of surprise. 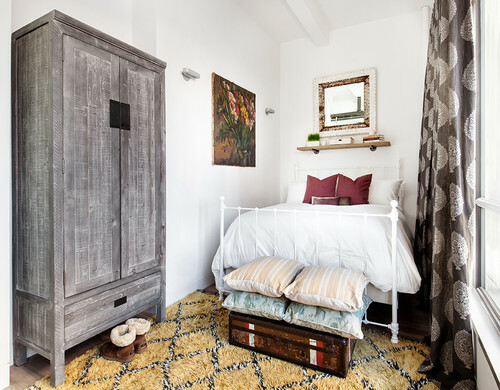 Believe it or not, this tiny bedroom is indeed in a mobile home. 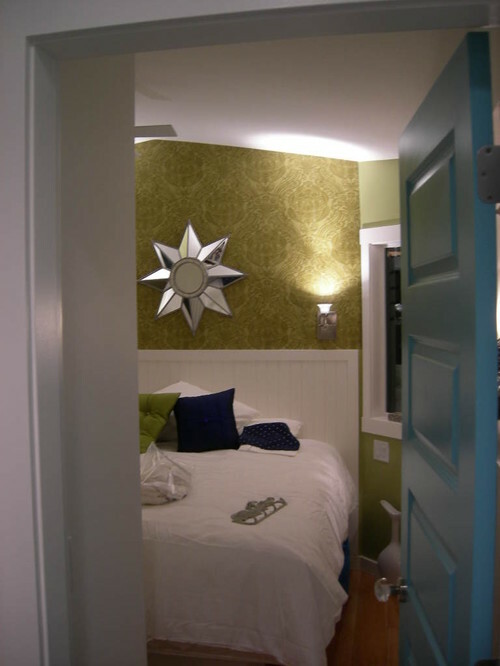 Damask wallcovering, a simple white headboard and bedding, and a turquoise blue door complete the understated design. 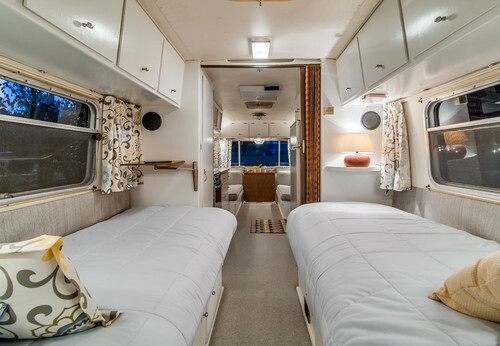 This Strathmere, NJ camper is the perfect example of “trailer chic.” As you can see from the photo below, the home boasts two sleeping spaces. McMullin Design out of Haddonfield created the fashionable and practical interior, proving that size and budget don’t make a great space. Obviously, in this camper, home really is where the heart is. Mister Kiss and Tell by Rob Thomas and Jennifer Graham. First, Rob Thomas brought us Veronica Mars, the clever, driven high school detective. It was clever, intriguing, thought-provoking and funny. We were all sad when it ended too soon. Then, a million die-hard fans heeded the call of Rob Thomas and funded what would be the biggest Kickstarter to date: Veronica Mars: the movie. 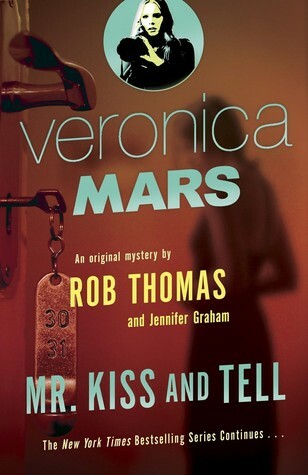 Finally, just for kicks, Rob Thomas collaborated with Jennifer Graham to write Veronica Mars novels. The second of these books, Mister Kiss and Tell, was published last year. If you have ever watched the show, it’s worth the time to pick up the books. The first one is even read by Ms. Mars herself, Kristen Bell. It’s practically like another episode of the show! A young woman is attacked at The Neptune Grand, the finest hotel in Neptune, California. Veronica is hired to clear the hotel of wrongdoing. But the more she digs, she becomes invested in helping the victim even if she loses money in the process. Mr. Kiss and Tell is gritty and dark. Peppered with the characteristic Veronica Mars wit, it is like an episode of the show but darker and with “adult” language. The story is not for the faint of heart. The author pulls no punches in reminding us of the darker side of humanity. Happily, the lighter side shines through as well. Lots of witty dialogue and a cute puppy help to balance out the tone of the story. Side plots involving a corrupt sheriff’s office and another about Veronica’s boyfriend Logan don’t add a lot to the story but they do keep the story from being monotonous. If you liked the show, you should definitely read the books; it’s basically bonus episodes of the show! 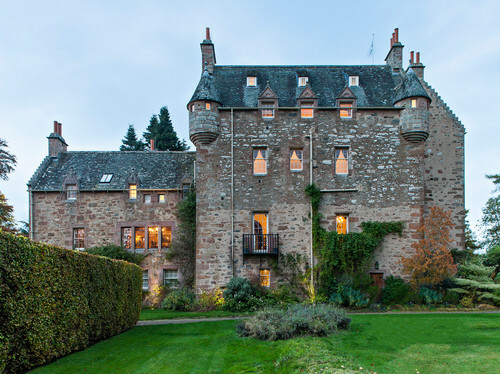 Have you ever pretended to live in a castle? Okay, so that might sound silly, but I think feeling like a princess, if even for a day, has been every little girl’s dream at one point or another. Even as adults, we can dare to dream! Let’s do just that. Here are five gorgeous bedrooms that embody castle life. Tall ceilings, wide moldings, and a circular turret (doesn’t every castle have a turret?) complete the architecture of this room. 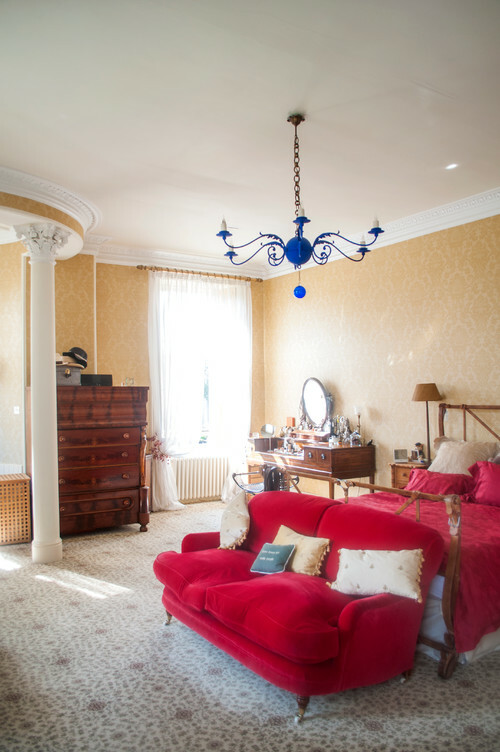 Located in Glasgow, Scotland, the red color choice and damask wall covering lend a regal feel. This bedroom is in a real castle. 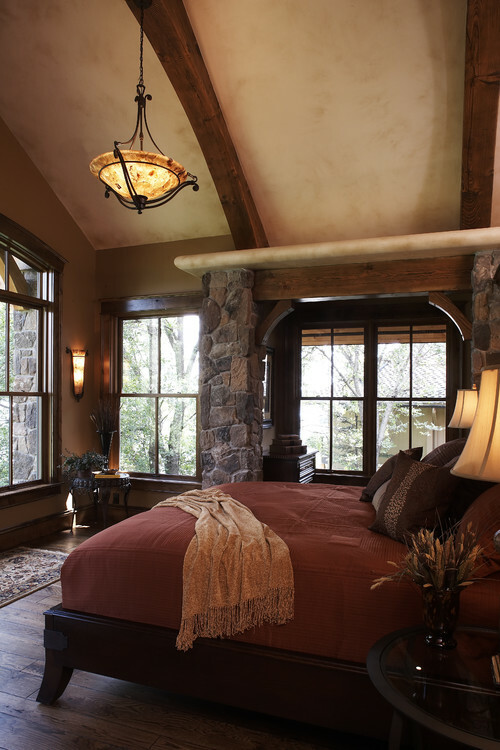 An arched ceiling, exposed wood, and interior stone details give this Minneapolis bedroom a castle-like feel. 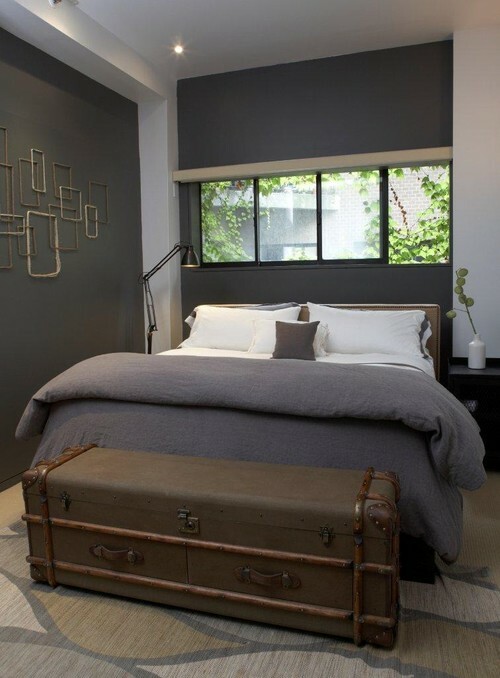 Warm and masculine, the room’s architecture is lovely, but the color palette and accessories could use some tweaking. Maxwell and Company modernized this castle in the UK. 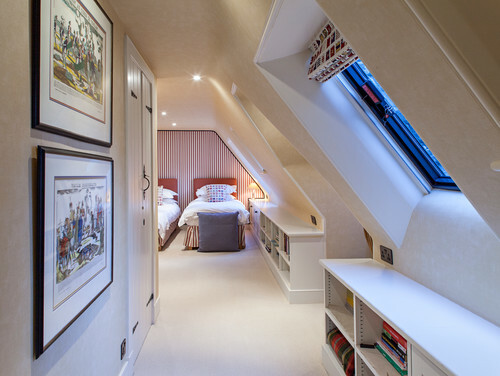 Twin beds work perfectly with the sloped ceilings. Upholstered walls and smart built-ins make this space pretty and practical. This home is also a real castle. 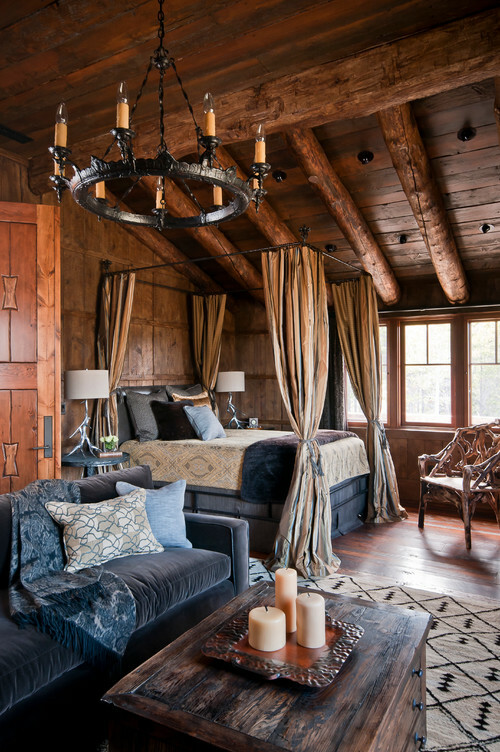 This mountain house takes on a medieval feel with its massive wood beams, pitched ceiling, velvet textiles, and bronze chandelier. The sprawling master bedroom’s sleep area and sitting area are separate, providing more than enough space for two people to use the room at once. One could easily be sleeping in bed while the other is relaxing or reading on the sofa. And for that little girl who can’t get stop dreaming of living in a castle, here’s her very own. 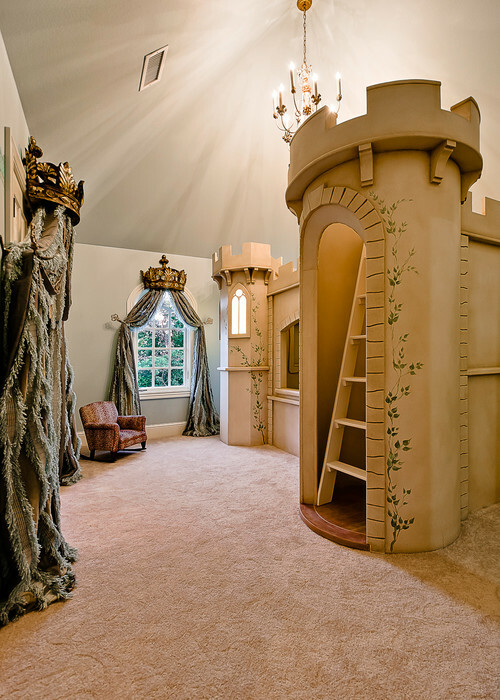 This clever castle bunk bed, formal window treatments, and crown cornices give the feeling that this bedroom exists in a castle, if only in that little lady’s imagination.